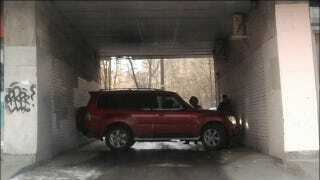 How did this Russian SUV end up parked like this? Even after staring at this bizarre picture for a while we still can't understand exactly how this Russian SUV ended up as you see it here. No details were included which left us to come up with our own explanation: Because Russia.